I am trying to make some animated cursors but when I open AniUtil, click new job and try to open the files nothing happens. Is there a tutorial explaining what to do to make a strip? This is what I do........ I make the animation in photoshop, each frame is on it's own layer. I then save each layer/frame seperately as a .png file in a folder that I have made especially for my cursor (so I can find it easily). when I save the individual frames I call them something like, Busy1, Busy2 Busy3 etc. I then open AniUtil (I am using version 1.3) and click "Process Images". I browse to the folder where I saved the seperate frames, and ctrl-click each one. (You will notice that it says on the titlebar "select the images to combine together). Then click open. The window changes to "save animation as", and in the same folder save it as Busy_ani. That's it really...... then when you are making the cursors in CursorFX, you just import the Busy_ani file and set the amount of frames and whether you want it to loop or not. I hope this helps........ If you can't figure it out, come back, and I'll try and help you some more. Thank you SO much for replying to my post because I am really excited to make my own cursors. But when I open AniUtil I see something totally different from what you described yours looks like. Once opened, there is only one option that says new job. When I click on that, the window to select my files opens but after I choose my files and I click open nothing happens. Very confusing. P.S. This is version 1.5 but I just bought Cursor FX last night so that was the version that's in the program. Are you SURE nothing happens when you click open? The change in window is very subtle. If you have highlighted all the frames you want in the animation and then clicked open, you should just be able to save them as one file in the same folder. I just tried version 1.5, and its just the same except it says new job instead of process images. So, when you click "new job", look carefully at the window title, it should say "select the images to combine together". Then when you have highlighted your individual frames and clicked "Open", look again at the window title, it should then change to "Save animation as". If it has, just give your animation a new name like Busy_ani, and save it. If the above doesn't work, then something is wrong........ are you saving the individual frames as .png files from Photoshop? Ok, I paid more attention to what it says at the top of the window and followed your directions. But it wouldn't let me save anything because it's telling me that they are all different sizes. The dimensions are actually all the same. But the KBs are different. I guess they must change when I add different colors. I know how to change the dimensions but I never had to change the KBs. It it easy? I think it means the dimensions..... Kb size is irrelevant. There must be subtle differences in the frame sizes for it to say that. The best way to create your animations is to start with a document size of say, 50 x 50 pixels, create your animation on several layers within that one .psd, and when it comes to saving the individual frames, do it by turning off all layers except the one you are saving, by using the "eye" icon on each layer. Then go to File - Save for web- set the format to PNG24 in the drop down box in the next window, and save to your preferred folder. Ok, I am going to do it the way you explained although I have a whole folder of various graphics I made already. Guess I will just have to do them all over again. In the meantime, I am going nuts with these cursors! I spent hours and hours going through every single page in the gallery and downloading tons of them to put in the program. Well, I almost did it. I have four frames different colors. But it only animates through the colors once not continuously. Then I have to click to get it to animate again. I played around with the intervals from 25 up to 300 but it doesn't seem to change anything. I'm not worried about doing my real work right now since I'm the boss and all I ever do is work. I just figured it out. I had to check the loop box. I LOVE THIS PROGRAM! Now I'm off to make a whole theme. HeHe...... i DID tell you! Thank you for offereing you help because I'm starting to feel guilty for bothering you so much. I wish they had more detailed tutorials. Now that I already made the standard cursor how do I make a whole theme? When I import a graphic for standard select it's no problem. But then when I click on busy and try to import a graphic for that it keeps going back to the window with all the cursors. OK...... make all your other cursors, and put them in the same folder as your standard cursor graphic. So when you click on busy and "import", it will go to the folder with all your other cursor graphics, and you can choose your "busy" graphic. Does that make sense to you? You are so smart! It totally worked. I made a theme from my logo and I'm thrilled! This is so much fun. I can't wait to make a bunch more for my friends. Of course, I will never be able to create anything as awesome as a majority of the ones in the gallery. But I know they will still be a lot better then the boring cursors my friends all have. What about those trails? I downloaded a bunch of them but it says to put it in the trails folder. However when I go into the program files I don't see a folder that says trails at all. Hmmmm I don't use trails, but I can't find a trails folder either..... I looked everywhere too! So, I can't help you with that I'm afraid. Maybe you could start a new thread and ask if anyone else knows where they are kept? 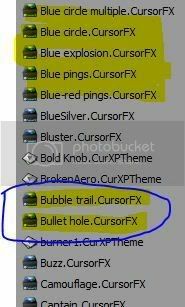 Not sure if you've noticed, but when you are creating a new theme and importing the graphics into CursorFX, there is an option to change the "pressed state" of your cursors. What this means is, you can make the cursor change when the mouse button is clicked, ie: it could change color, or shape, or whatever you want. When you are in the cursor editing window, look in the top right corner of where the cursors are displayed, and you will see some blue writing that says "View pressed state". When you click that, you have the opportunity to import changed graphics that will appear when the mouse is clicked. These are not necessary of course, but it's a chance to have some more fun with the way your cursor behaves. Thanks for telling me. I love it! Can this program get any better? I made some sets for a few of my friends and got them to download the program. They are thrilled. In the learning video he talks about getting more effects. Do you know where to get those? If I am not mistaking the effects are only enabled in Cuursor FX Plus which is a purcahseable Version. BTW You were talking to 1 of the best and most downloaded cursor builders around. Harley....we need to send Bryan a new hat! I just got a new hat from Jafo!! Yes, I found the effects and now I know how to make my own. SO much fun! Now that I learned how to make all this cool stuff I'm bummed! I've been going back and forth with tech support the last few days but so far they haven't been able to help me. Shutting down, or locking up? Locking up can be fixed. What OS are you on and what bit? ex... Win 7 64 bit. After I do one or two states I get that dreaded message "CursorFX Theme Editor has encountered a problem and needs to close. We are sorry for the inconvenience". Then I have to hit ctrl/alt/delete to get out of it. I don't understand because the first few days after I bought the program it was working fine. I'm using XP with 32 bit.